Heat oven to 350°F. Grease bottom of 13x9-inch pan. In large bowl, combine all brownie ingredients; beat 50 strokes with spoon. Do not undermix. Spread in greased pan. Bake at 350°F. for 31 to 33 minutes. Immediately after removing brownies from oven, sprinkle with chocolate chips and pecans. Drizzle with hot caramel mixture. Cool 1 hour or until completely cooled. Cut into bars. Place caramels and milk in a small microwave-safe bowl. Microwave on HIGH 1 minute stirring after 30 seconds. Stir. Microwave on HIGH an additional 30 seconds, until caramels are melted. These brownies make great sundaes. 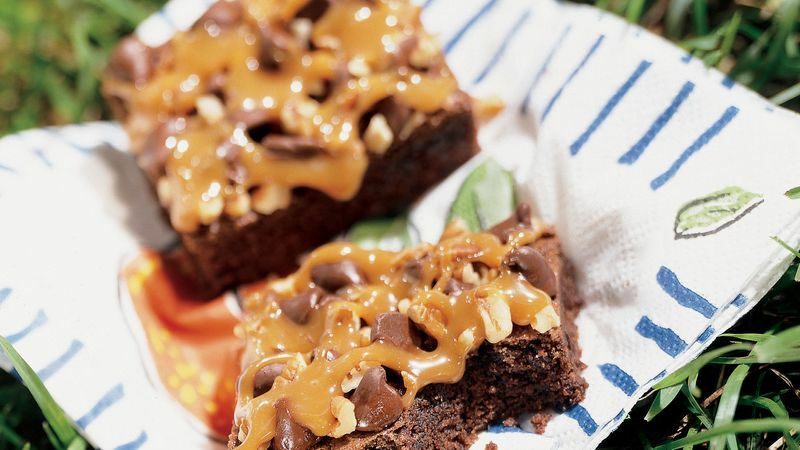 Place the brownies in bowls and top them with scoops of ice cream, then drizzle with hot caramel of fudge sauce.